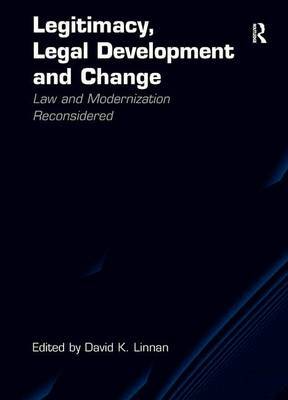 This book addresses critical questions about how legal development works in practice. Can law be employed to shape behavior as a form of social engineering, or must social behavior change first, relegating legal change to follow as ratification or reinforcement? And what is legal development's source of legitimacy if not modernization? But by the same token, whose version of modernization will predominate absent a Western monopoly on change? There are now legal development alternatives, especially from Asia, so we need a better way to ask the right questions of different approaches primarily in (non-Western) Asia, Africa, the Islamic world, plus South America. Incoming waves of change like the 'Arab spring' lie on the horizon. Meanwhile, debates are sharpening about law's role in economic development versus democracy and governance under the rubric of the rule of law. More than a general survey of law and modernization theory and practice, this work is a timely reference for practitioners of institutional reform, and a thought-provoking interdisciplinary collection of essays in an area of renewed practical and scholarly interest. The contributors are a distinguished international group of scholars and practitioners of law, development, social sciences, and religion with extensive experience in the developing world.